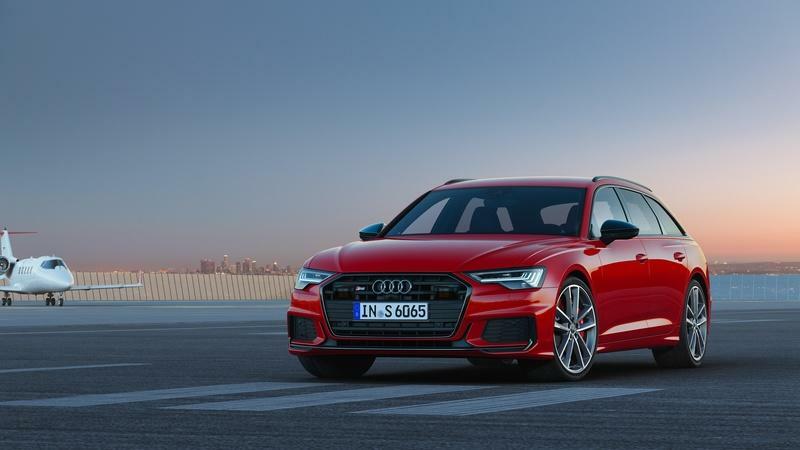 Outside, the 2019 Audi S6 Avant brings the usual Four-Ring aesthetic update, which basically equates to a few nips and tucks added here and there. 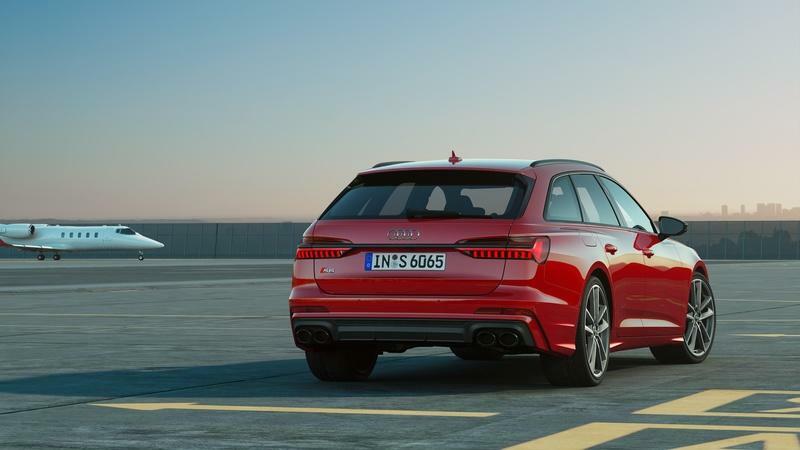 The new look falls in line with the latest C8 generational changeover, and while on balance it isn’t terribly different from anything we’ve seen from Audi in the past, the new S6 Avant definitely does look a bit sharper and slightly more futuristic than it did before. That also includes a hearty dose of aggression that’s unique to Audi’s “S” model line, which helps the S6 standout from the standard A6. Standard spec includes dark chrome trim and aluminum bits added from front to back, as well as purposeful aero upgrades. Viewed head on, the 2019 Audi S6 definitely looks the part of a low and wide performance machine. Front and center is Audi’s traditional Singleframe grille design. While this primary intake is definitely big, it actually looks a little smaller than the taller grille found on the outgoing S6. Under the grille is a prominent chin spoiler, while the lower corners ditch the older model’s fog lights in favor of technical air blade elements. Higher up, the horizontal headlight housings are sharper and more pointed for the 2019 model year, and come with revised daytime running light graphics. The net result is a nose that looks wider and lower than before. It’s a theme we see continued into the profile, where the S6 rocks a lowered ride height compared to standard A6 lineup. The new S6 also comes with revised character lines that enhance the visual width of the front and rear fenders, under which Audi mounts standard 20-inch alloy wheels. Larger 21-inch wheels are offered as an available option. Up top, you’ll find blacked-out roof rails, while the angle of the roofline reminds us of the Porsche Panamera. 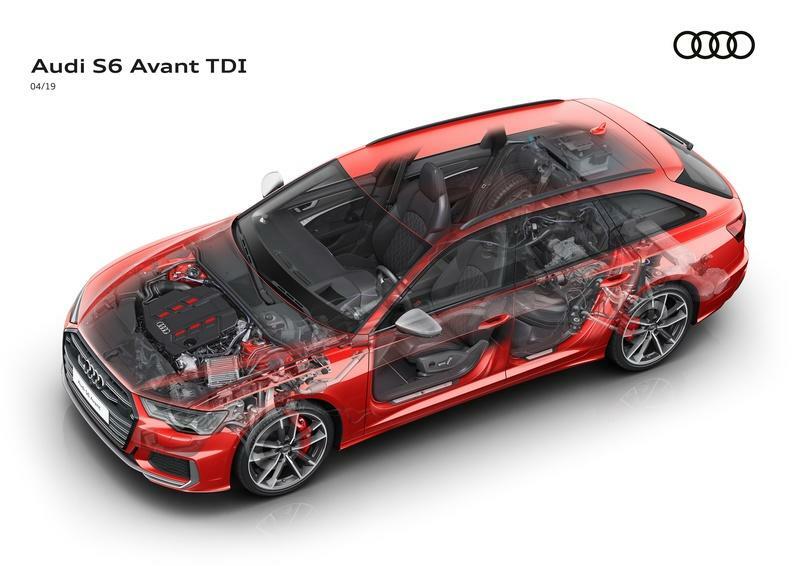 The Avant’s tail section also extends outwards to accommodate extra cargo room. Finally, we have the S6 Avant’s tail section, which features a rear diffuser with a dark chrome matte finish. There’s also four exhaust pipes compared to the standard twin outlets on the A6, plus an integrated roof spoiler. A single dark character line connects the taillight housings and adds further visual width. 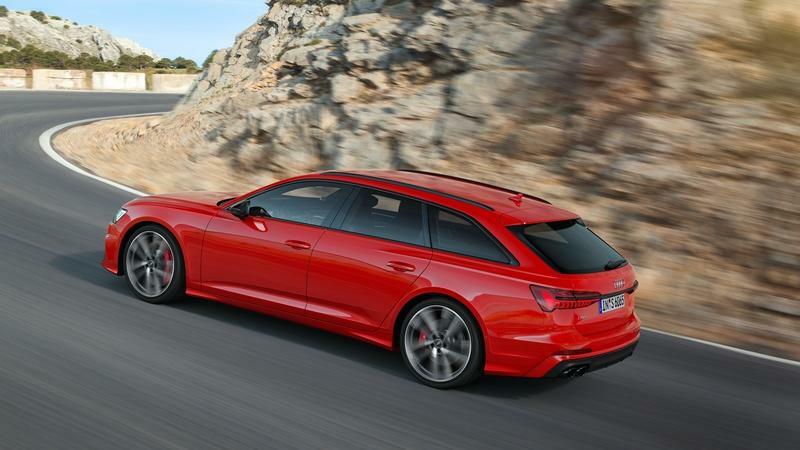 Compared to its chief rivals, which include the Mercedes-AMG E 43 4Matic Estate and BMW 540i xDrive M Sport Touring, we think the S6 Avant is definitely the best-looking option out there. 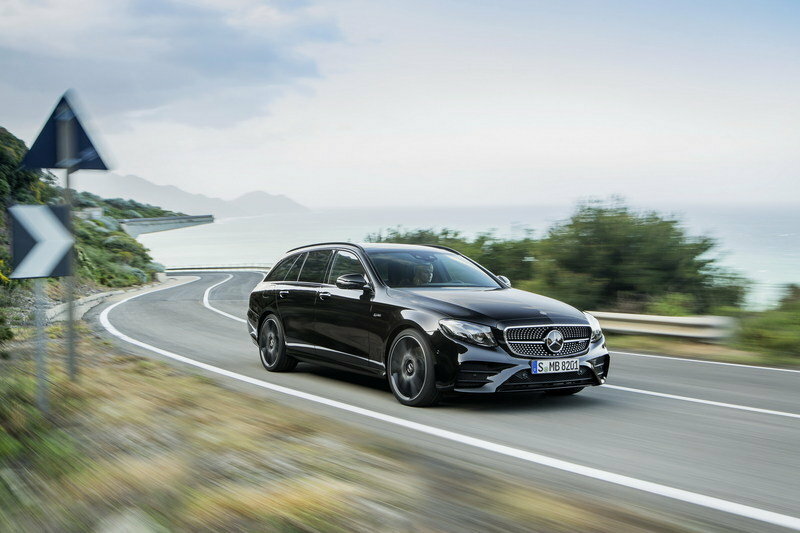 The sharp styling elements play well with the long, sleek body style, whereas the Merc and Bimmer look much chunkier and even slightly bloated from certain angles. We think the Audi’s dark trim pieces also work much better with the performance theme than the polished chrome of its rivals. And while the look doesn’t really change much year to year, we’re not all that bothered - this thing looks good regardless, and that’s enough to make us forget Audi’s slow styling evolution. 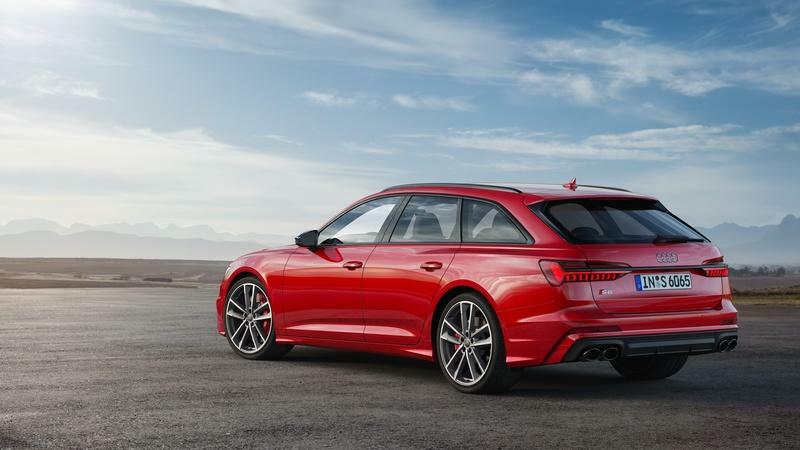 Take a step inside, and you’ll find the 2019 Audi S6 Avant once again takes its cues from the new C8-generation A6, with a cabin layout that’s essentially identical between the two models. Compared to the previous generation, the new-gen brings new digital gauges, dual infotainment screens in the dash, a simplified array of hard buttons on the central tunnel, and wide climate control vents along the upper portion of the dash, plus a number of geometric styling elements throughout. All told, we definitely prefer this latest cabin style to that of the older model. We think the simplified, streamlined aesthetic plays perfectly to the S6’s luxury aspirations, and it also incorporates the sportier elements of the S line quite nicely. Side by side with rivals from Mercedes and BMW, the S6 feels modern, yet mature. While the huge screens, copious glossy trim, and ample ambient lighting in the AMG E 43 definitely give the Merc that extra “wow” factor, it also feels a little gimmicky next to the more elegant Audi. What’s more, the stand-up infotainment screen and button-stuffed center console in the 540i M Sport feel dated next to the twin-screen setup in the S6. Moving on, the 2019 S6 Avant comes with all the usual S-line bits and pieces, including S badging throughout, a black and silver color palette, and contrasting stitching. Standard spec includes a three-spoke multifunction steering wheel, but a sportier flat-bottom option is also offered. Lower in the cockpit, you’ll find stainless steel pedals and illuminated aluminum sill trim. As in years past, Audi is once again offering a decent number of customization options for the S6 heading into the 2019 model year. Standouts include a selection of leather and Alcantara upholstery as standard, or Valcona leather as an available upgrade. Color schemes include black, rotor gray, or arras red. Brushed aluminum trim is standard, while fine grain ash trim is optional. 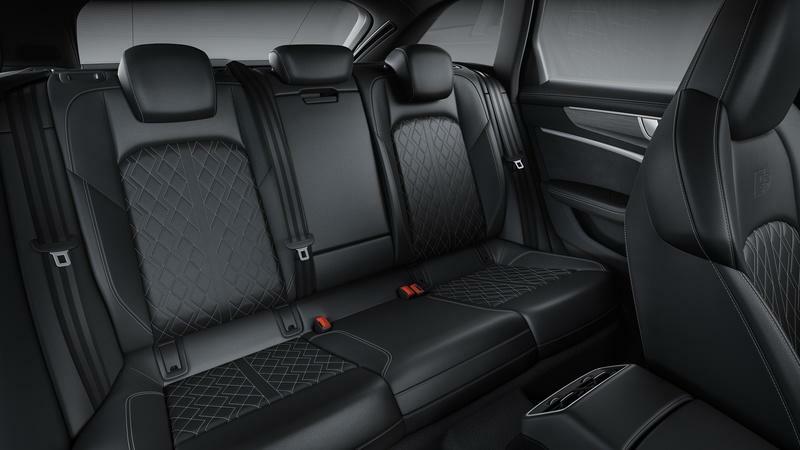 The S6 Avant also gets a set of standard sport seats embossed with the S logo in the seat backs. More lateral support is offered with upgraded sport seats and integrated head restrains, or you can add extra comfort with multi-adjusting sitters outfitted with both ventilation and massage functions. Four-zone automatic air conditioning is standard. On the infotainment front, Audi replaced the older model’s standard analogue/digital gauge combo with its branded Virtual Cockpit system as standard. Featuring a large 12.3-inch display mounted just behind the steering wheel, the Virtual Cockpit comes with several configurations. MMI navigation is included as standard. It’s worth mentioning that the Mercedes E-Class also offers a large 12.3-inch digital gauge display, which actually stretches across the dash to meet with a 10.25-inch screen above the center console, creating what appears to be a single cohesive display unit. While certainly striking to look at, we prefer the Audi’s segmented screen layout, which we think looks more orderly and cleaner than Merc’s display setup. Meanwhile, BMW offers a smaller 8.8-inch Dynamic Digital Instrument Cluster as standard with the current 5 Series, but the spec will see an upgrade soon when BMW updates to the 7.0 infotainment system and Live Cockpit feature. 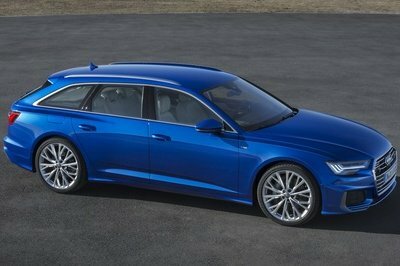 Back to the Audi, Ingolstadt has yet to provide us with a breakdown of the 2019 S6 Avant’s safety tech spec, but we expect it to include optional upgrades like automatic braking, adaptive cruise control, automatic high-beam assist, and lane-keep assist. 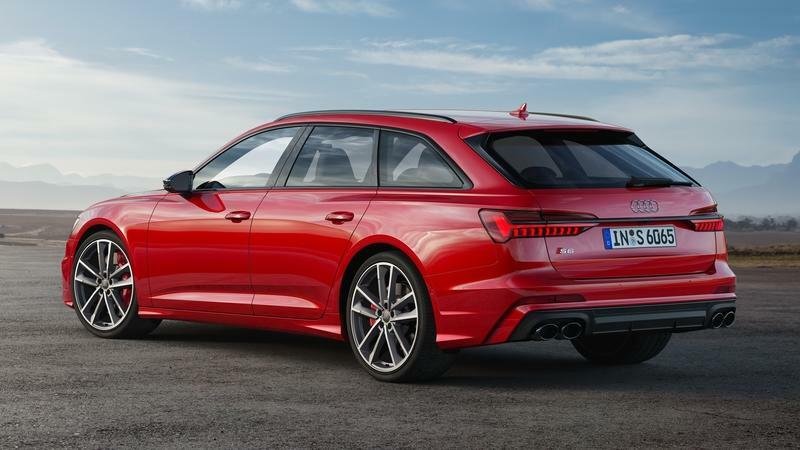 Finally, the wagon-bodied S6 Avant provides ample cargo capacity, with as much as 1,680 liters (59.3 cubic-feet) available with the rear seat down. That’s about on par with the BMW 5 Series’ 60 cubic-feet, but a bit under the 64 cubic-feet you get with the Mercedes-Benz E-Class. 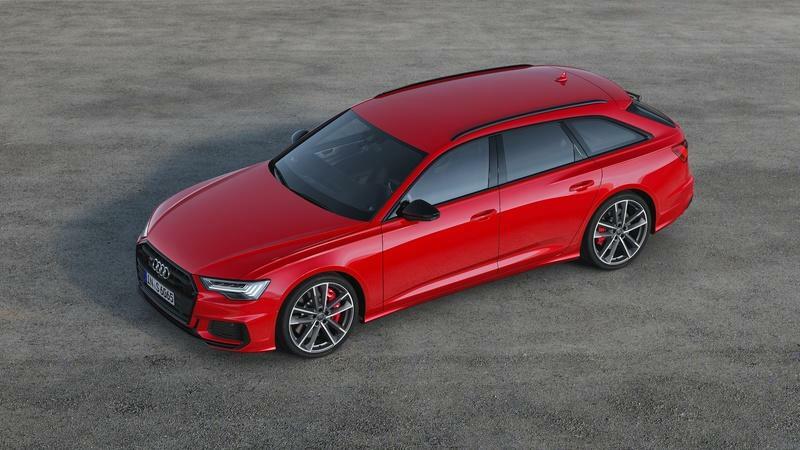 One of the 2019 Audi S6 Avant’s biggest upgrades can be found under the hood, where the outgoing model’s petrol-powered 4.0-liter V-8 was replaced with a 3.0-liter V-6 diesel. Rumored had it Audi was leaning towards a performance oil-burner for this generational changeover, and now that rumor is confirmed, as the gas-option is officially off the table. Even more interesting is that the ‘six also comes with 48-volt electric assistance, otherwise known as a “mild-hybrid” setup. It’s a setup that’s similar to the recently released SQ5 TDI, boosting both power and efficiency without the complexity of a full hybrid system thanks to a belt alternator starter and lithium-ion battery pack under the vehicle floor. Essentially, the system works like an “electric supercharger,” juicing the compressor with 8 kW of power for a quicker boost spool. Audi says the system fires up in less than 250 milliseconds and can spin at 70,000 rpm. It’s a pretty slick setup, and even though it keeps emissions and fuel efficiency high, you still get the sharp throttle response of a large-displacement engine. In addition to the electric compressor, the S6 also gets a traditional exhaust-driven turbocharger, which by itself pumps out a heady 2.4 bar (34.8 psi) of boost. 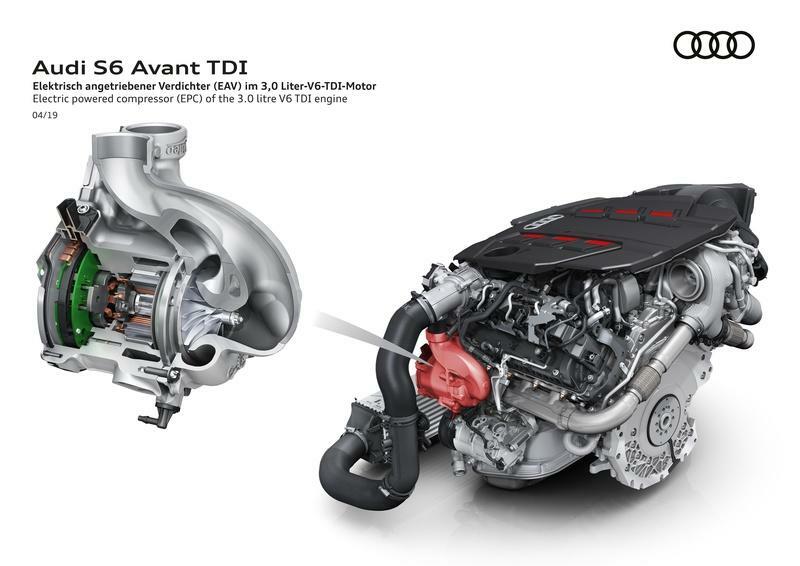 All said and done, the new diesel-powered S6 doles out 349 horsepower. That ain’t bad for a wagon, but the truly impressive figure is the torque, which is rated 516 pound-feet, coming online at just 2,500 rpm. 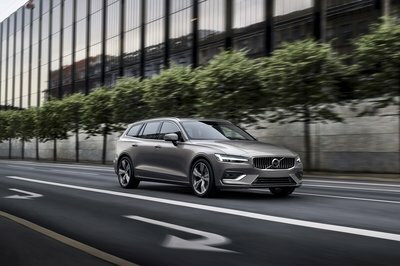 Properly motivated, the 2019 S6 Avant will accelerate to 100 km/h (62.1 mph) is just 5.1 seconds. Top speed is limited at 155 mph. Unfortunately, that 0-to-60 mph time is about half a second slower than the outgoing model, but it’s still on target for the segment. For example, the Mercedes-AMG E 43 4Matic makes 396 horsepower and 348 pound-feet of torque from a twin-turbo 3.0-liter V-6, good enough for a run to 60 mph in 4.6 seconds. 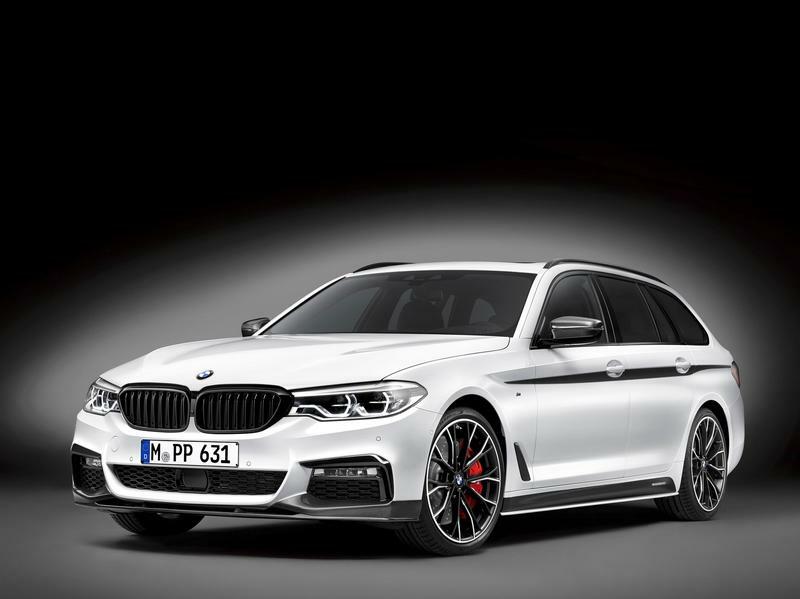 Meanwhile, the BMW 540i xDrive M Sport Touring makes 335 horsepower and 332 pound-feet of torque thanks to a 3.0-liter inline six-cylinder, with the run to 60 mph requiring 5 seconds dead. Both models top out at an Audi-matching 155 mph. Lined up side by side, the S6 Avant is slower than the Merc and about even with the Bimmer in terms of acceleration. However, the S6 Avant stands out for two very clear reasons - not only is it a diesel, but it’s also got mild-hybrid electric assistance, which combine to create gobs of low-end torque. Rest assured, that’s something that’s definitely noticeable on the street. This thing is sure to be a superstar when it comes to quick-passing maneuvers. As previously mentioned, the electric compressor also helps with overall efficiency, and will even enable the car to coast for as long as 40 seconds with the internal combustion engine turned off. 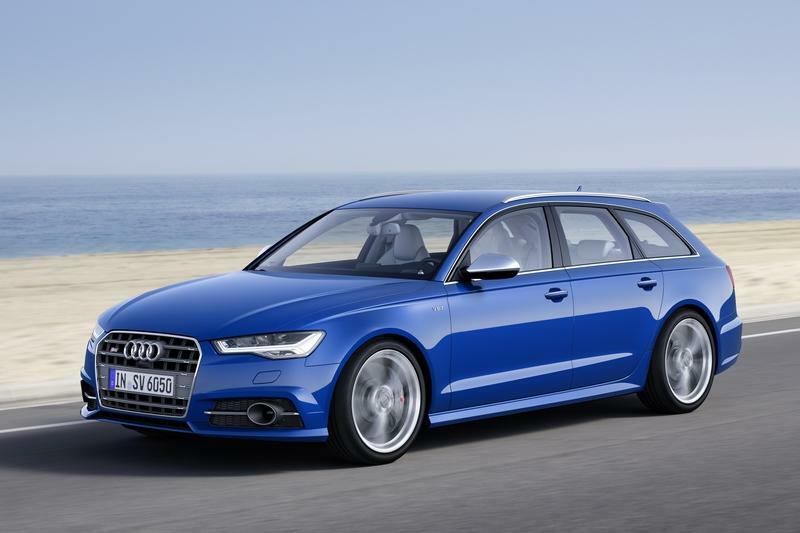 Audi says the S6 Avant posts a combined mpg of 36.2 mpg, which is a big jump from the outgoing model’s 30 mpg. 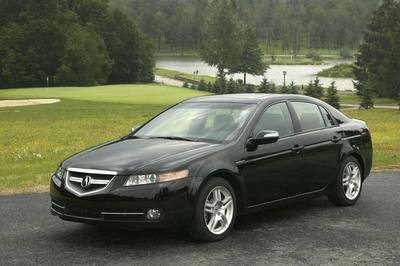 It also bests the Merc’s 32.8 combined mpg, but falls just shy of the Bimmer’s 37.6 combined mpg. 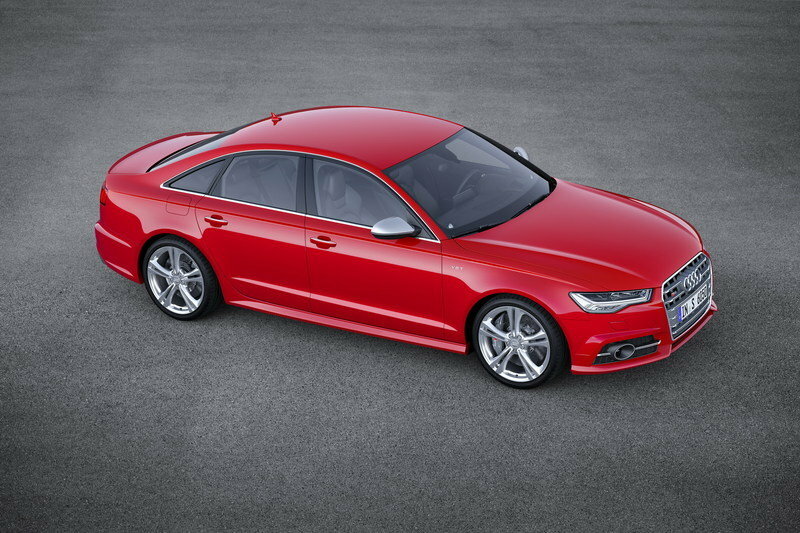 The rest of the S6’s drivetrain includes an eight-speed tiptronic automatic transmission and quattro all-wheel drive as standard. The setup distributes torque in a 40/60 ratio front to back, with a maximum split of either 70 percent in front or 85 percent in the rear depending on available grip levels. Standard spec includes a self-locking center differential, plus the option for a rear “sport” differential. The smaller V-6 in the engine bay means less weight over the front axle, which definitely works to improve the handling. Further agility comes with standard S sport suspension with damping control, which lowers the ride height by 20 mm (0.8 inches) compared to the standard A6’s suspension setup. You can also get an adaptive air suspension system with adjustable dampening force, which Audi offers as a “comfort-oriented alternative.” The air setup comes with three mode settings, including one with a higher ride height for rough roads, an automatic mode that lowers the body by 10 mm (0.4 inches) when traveling over 120 km/h (74.6 mph), and a dynamic mode that keeps the body close to the ground at all times. There’s also a wheel-selective torque control system, or torque vectoring, which will apply the brakes to the S6’s inside wheels while cornering for better grip. A sport steering setup points the wagon where desired, with a ratio that varies between 9.5:1 to 16.5:1. 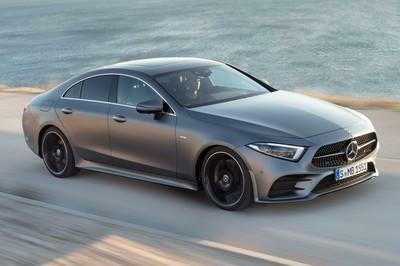 Headlining the list of updates for the 2019 model year is an optional all-wheel steering system, a first for the S6. Opt into this, and you’ll get a separate rear-axle steering system complete with a spindle drive and track rods. The system can turn the rear wheels by as much as 5 degrees in the opposite direction as the front wheels at speeds up to 60 km/h (37.3 mph), while over 60 km/h, the system will turn the rear wheels by as much 2 degrees in the same direction as the front wheels. The ultimate result is more agility at low speeds, and greater stability at high speeds. Running it all is an electronic chassis management system, which harmonizes all the electronic bits by collecting data from various sensors and calculating the appropriate settings. This extends to the all-wheel steering system and sport differential, when equipped. Throwing the anchor are six-pot aluminum calipers, which are painted in black and come with the option for a red finish. These large calipers clamp onto equally large 400 mm (15.7-inch) discs in front and 350 mm (13.8-inch) discs in back. If you intend on doing some performance driving every so often, make sure to grab the optional carbon ceramic brakes, which come with 400 mm (15.7-inch) front discs and 370 mm (14.6-inch) rear discs that cut overall unsprung weight by 9 kg (19.8 pounds). Finally, the standard tire sizing is set at 255/40R20. Audi also offers an optional sport tire compound if desired. 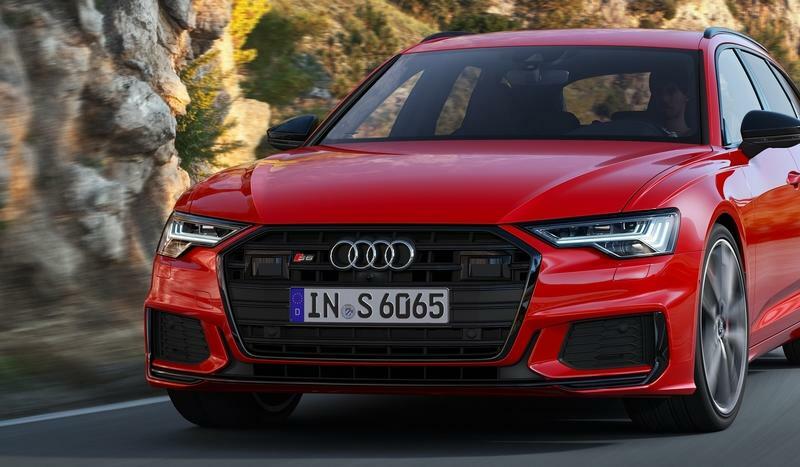 As for those interested buyers residing here in the U.S., the new S6 will come with a 2.9-liter TFSI engine, which replaces the current model’s 4.0-liter V-8. 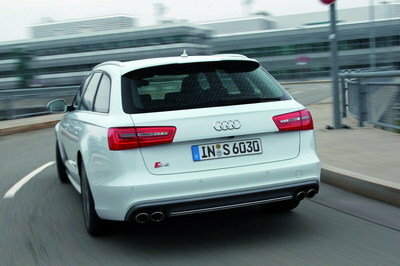 It’s the same powerplant found in the RS4 Avant and RS5 Sportback, and it too comes with a 48-volt mild-hybrid system. Output is rated at 450 horsepower and 443 pound-feet of torque. No word on acceleration figures, but the current model’s 450-horsepower V-8 can send the U.S.-spec S6 to 60 mph in 4.4 seconds. 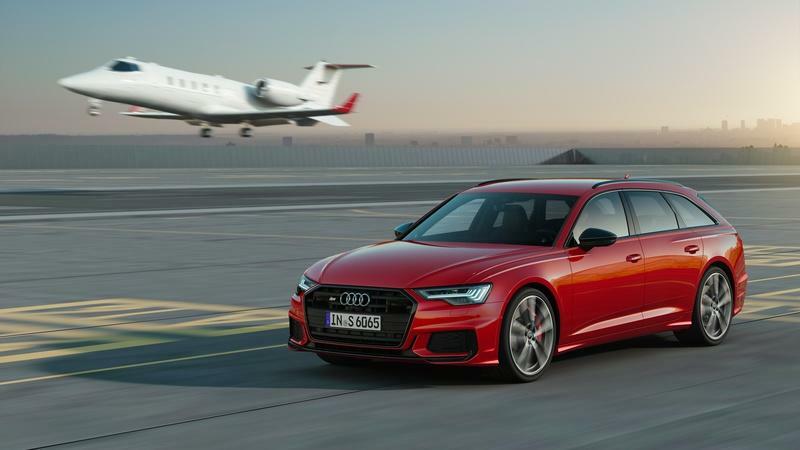 The 2019 Audi S6 Avant is headed to the European market in the summer of 2019. Pricing starts at 79,000 euros in Germany. 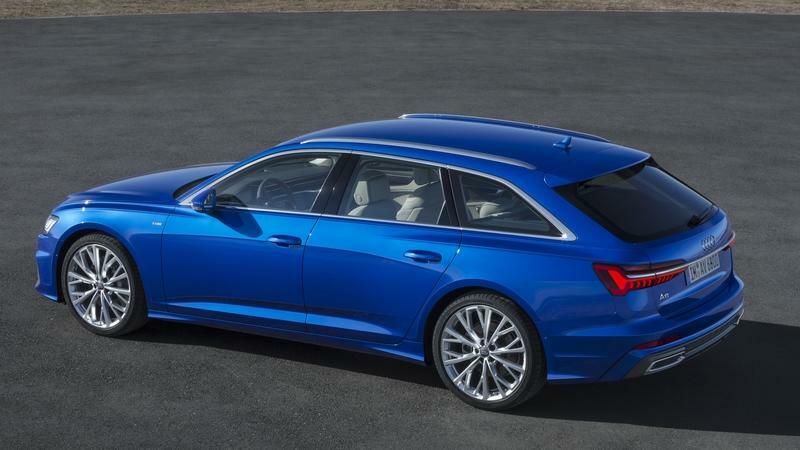 No word on whether or not Audi will offer the S6 Avant here in the U.S., but it’s unlikely, despite relatively recent tweets that Audi might finally bring the long-roof Sixer to these shores. Those of our readers living in Europe have all manner of fast, five-door wagons to play with, including this bruiser from Mercedes-AMG. Situated just below its even-faster sibling, the E 63, the E 43 arrives to the party rocking a turbocharged 3.0-liter V-6 under the hood, which doles out as much as 396 horsepower and 348 pound-feet of torque through a nine-speed automatic transmission. Grip is provided by the 4Matic all-wheel drive system, which biases torque towards the rear axle for extra lively handling. The interior is also a rather nice place to be. 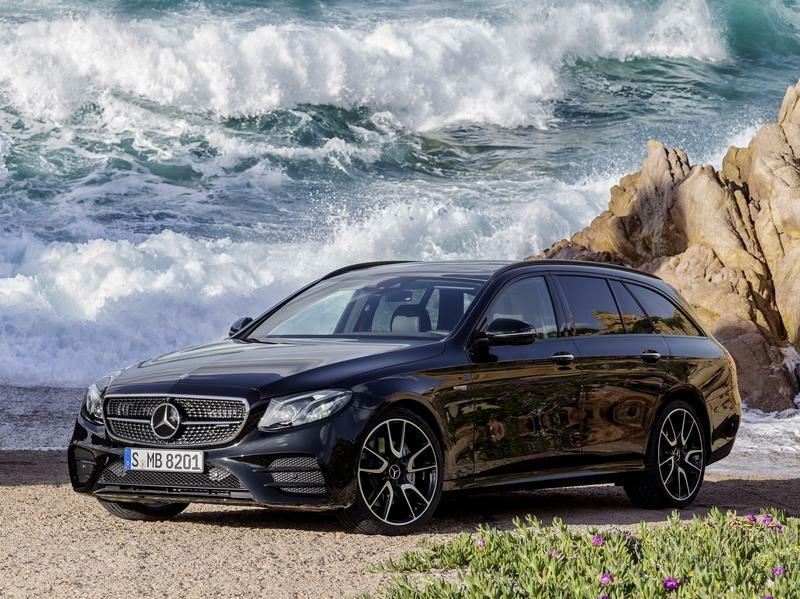 Read our full review of the 2017 Mercedes-AMG E43 4Matic Estate. The Bavarians also play in this space, offering up the 5 Series to compete against Audi’s line of 6’s and Merc’s line of E’s. 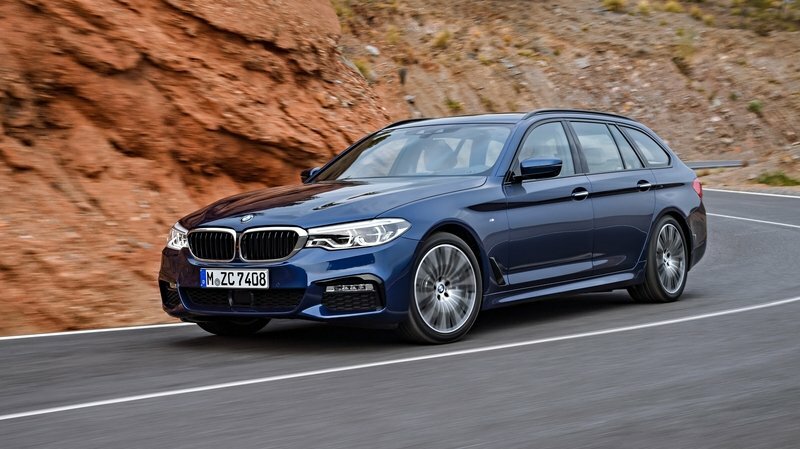 Going head-to-head with the S6 Avant will be the 540i xDrive M Sport Touring, a mouthful of a name that adds all-wheel-drive grip and extra M Division speed to the mix. It looks great with its kidney grille up front and aggressive proportions in the flanks, while a decent wallop under the hood is provided by a turbocharged powerplant. It’s also got oodles of room in the interior and plenty of gadgets to boot. While a slower, diesel-powered S6 might not look all that great on paper, the devil is in the details with this one. Let’s start with that mild-hybrid oil burner under the hood. While it’s definitely a bit slower in the sprint to 60 mph, the latest S6 Avant makes up for that with improved efficiency and, critically, a lot more torque. The net result is that driving this thing around town will feel much more rewarding than the outgoing model’s petrol-powered predecessor, with oodles of twist on demand making short work of passing maneuvers. 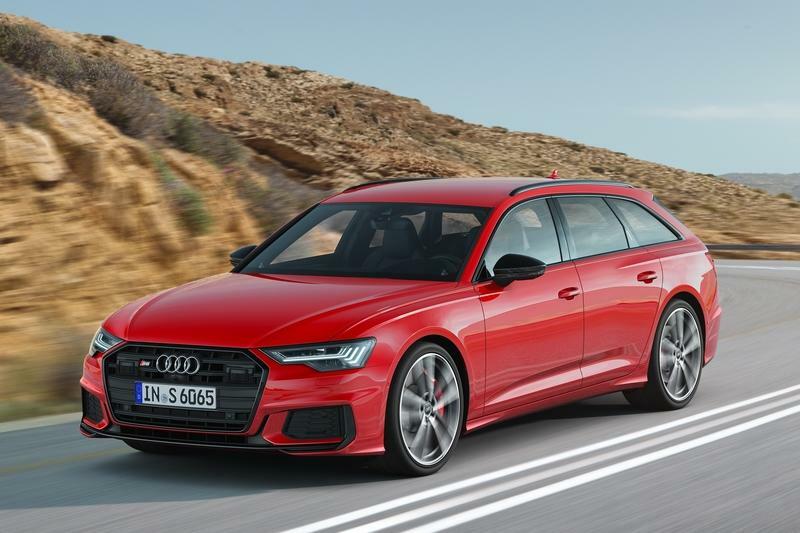 Indeed, while mixing speed, comfort, and practicality isn’t always an easy thing to do, the 2019 S6 Avant pulls it off, finding the right balance between all three. While there are faster, more comfortable, and more practical options out there, there are few models that mix each characteristic so well, and in such equal proportions. 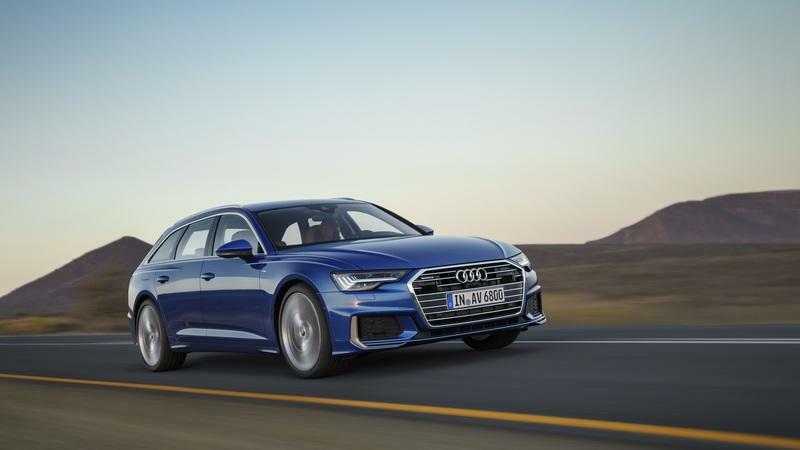 Read our full review on the 2019 Audi A6 Avant. Read our full review on the 2018 Audi A6 sedan. 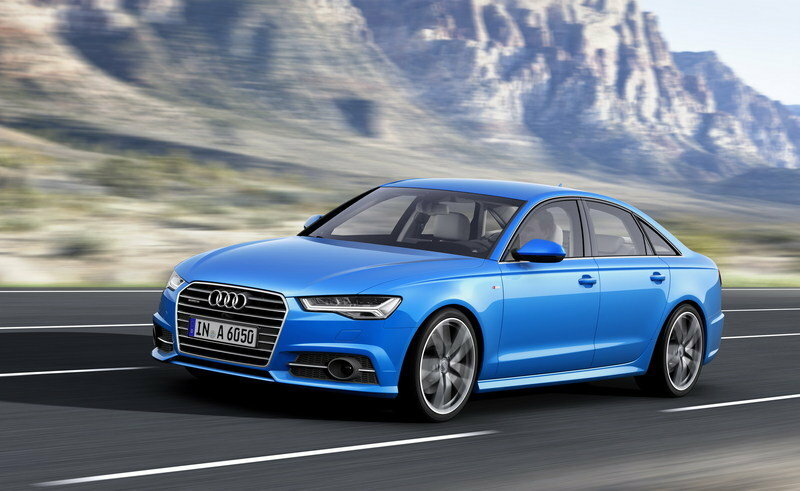 Read our full review on the 2016 Audi S6.